Everyone’s raving about MAC‘s new Hello Kitty line of cosmetics. I have always loved Sanrio’s characters, and of course have been a MAC addict for quite some time. Now, two of my favorite things are together? Amazing! I purchased the Hello Kitty Beauty Powder in Tahitian Sand. It’s a finishing powder with a new dewy/glow feel to it. The packaging is adorable, and I’ve been using it on my face with just some moisturizer for the past few days. I’ve also tried it as a finishing powder on a full face and I absolutely loved it. It’s a light weight pressed powder that comes in two shades. If you’re more tan like I am I suggest purchasing the Tahitian Sand as well. If you’re a little more on the pale/rosy side, definitely go with the other color. Best part? 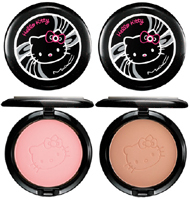 Hello Kitty’s face is on the powder itself. It’s almost too cute to use! MMMM… I love the shaken ice tea at Starbucks.. but with Greentea though. It’s my favorite summer drink because it’s so refreshing. The hello kitty MAC thing is outrageous!! haha. People were going crazy when I was at the MAC counter last week!! that drink looks phenomenal too, I may just pick one up on the way to work tomorrow! Starbucks is the devil, by the way. They’re just so…tasty. Tasty and expensive. Calorieking.com says a tall one of these has 95 calories. So I’ll probably pick one up tomorrow. And hate it for being so damn tasty. I agree with Chiui, this post made me want Starbucks too, though I don’t think I’ve ever ordered that particular drink. I don’t like Starbucks’ coffee but their teas are amazing! I agree with Felisa – they’re coffee is horrible, but the teas are amazing! And as far as exercising, I’m so up for the elliptical! It’s my new baby. I’m really fond of going to Starbucks but i’ve never tried that drink before. Thanks for the recommendation, i’ll see if we have it here as well. i just wrote “shaken black tea lemonade” on my hand so i can remember to go get one on my way home. though idk if its weather appropriate. i usually get cold drinks when its winter anyways this should be no different. I haven’t tried any of those things that make you happy. I think my list would be very different. I’m actually not sure what I would put on my list. I think I just might have to try that at starbucks. Its cold as hell here still, so I’ve been mostly drinking white chocolate mocha lattes, which are completely horrible for you….. oops. starbucks is my favorite but i havent tried that yet. i think i will. …are you insisting that I be healthy?